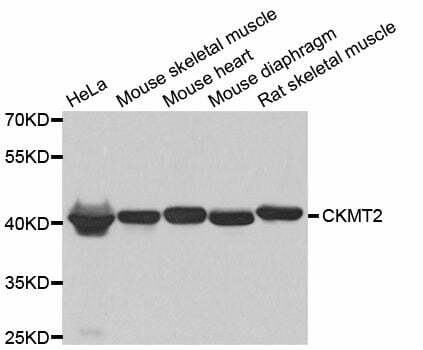 Small volumes of anti-CKMT2 antibody vial(s) may occasionally become entrapped in the seal of the product vial during shipment and storage. If necessary, briefly centrifuge the vial on a tabletop centrifuge to dislodge any liquid in the container`s cap. Certain products may require to ship with dry ice and additional dry ice fee may apply. Mitochondrial creatine kinase (MtCK) is responsible for the transfer of high energy phosphate from mitochondria to the cytosolic carrier, creatine. It belongs to the creatine kinase isoenzyme family. It exists as two isoenzymes, sarcomeric MtCK and ubiquitous MtCK, encoded by separate genes. Mitochondrial creatine kinase occurs in two different oligomeric forms: dimers and octamers, in contrast to the exclusively dimeric cytosolic creatine kinase isoenzymes. Sarcomeric mitochondrial creatine kinase has 80% homology with the coding exons of ubiquitous mitochondrial creatine kinase. This gene contains sequences homologous to several motifs that are shared among some nuclear genes encoding mitochondrial proteins and thus may be essential for the coordinated activation of these genes during mitochondrial biogenesis. Three transcript variants encoding the same protein have been found for this gene. Western blot analysis of extracts of various cell lines, using CKMT2 antibody at 1:1000 dilution. 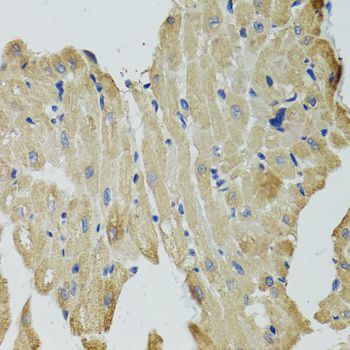 Immunohistochemistry of paraffin-embedded rat heart using CKMT2 antibody at dilution of 1:100 (40x lens). 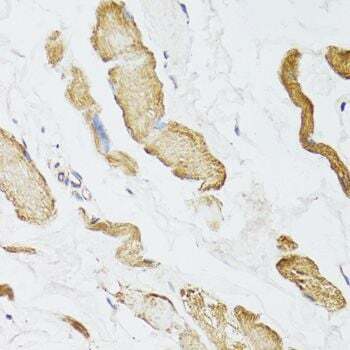 Immunohistochemistry of paraffin-embedded human esophagus using CKMT2 antibody at dilution of 1:100 (40x lens). 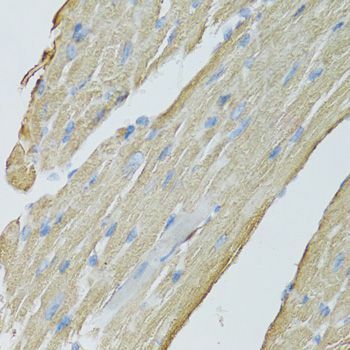 Immunohistochemistry of paraffin-embedded mouse heart using CKMT2 antibody at dilution of 1:100 (40x lens). NCBI/Uniprot data below describe general gene information for CKMT2. It may not necessarily be applicable to this product. CKMT2: Reversibly catalyzes the transfer of phosphate between ATP and various phosphogens (e.g. creatine phosphate). Creatine kinase isoenzymes play a central role in energy transduction in tissues with large, fluctuating energy demands, such as skeletal muscle, heart, brain and spermatozoa. Belongs to the ATP:guanido phosphotransferase family.